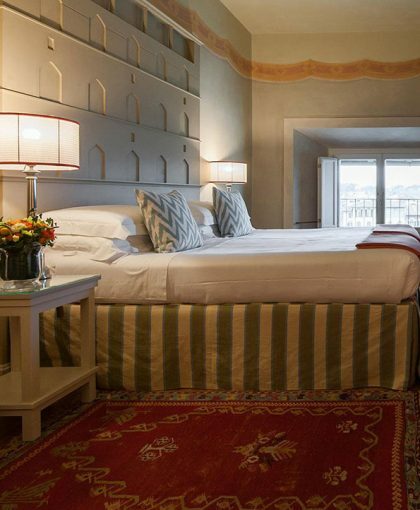 The sunset fills this beautiful room with colors; it is finely decorated with frescoes, and has three large windows overlooking the Arno River and Palazzo Feroni Spini. A view of the main bridges of Florence – Ponte Vecchio and Ponte Santa Trinita – really make the panorama unique. 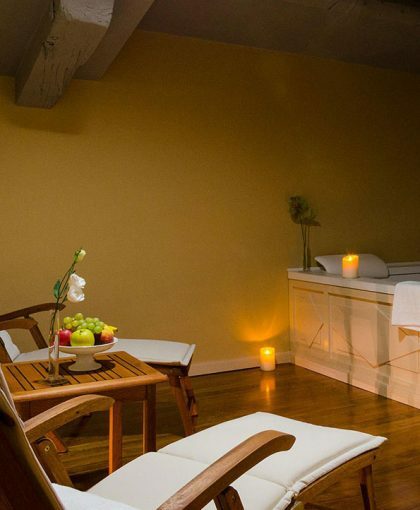 A nice candlelight bath in the large hot tub, surrounded by the scent of incense and rose petals, will refresh you after a busy day of work or sightseeing in Florentine museums. 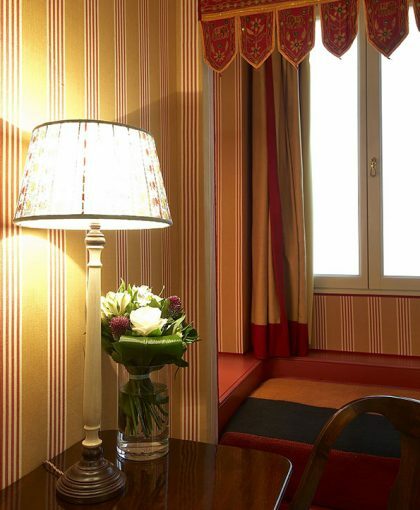 The walls in beige and light blue lines are decorated in “damask motif”, inspired by a Florentine cloth of the 1700s. The room has an area of 35 square meters, oak flooring, bed with wall canopy, circular marble table with comfortable chairs, large sofa, Calacatta Gold marble bathroom with separate toilet, “panoramic” hot tub and shower, high resolution LCD TV, DVD player, telephone with direct outside access, mini-bar, electronic safe. The room, heated and air conditioned, offers free Wi-Fi access, shoehorn, slippers and hairdryer. 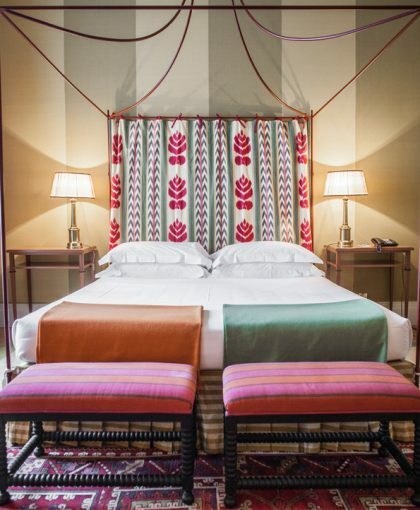 The room can be connected to a Deluxe room. 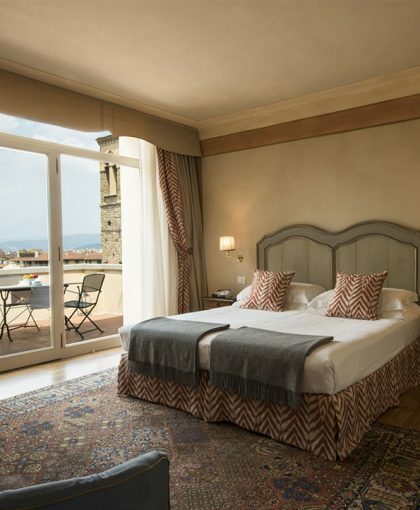 The charming terrace overlooking the Arno River and the Ponte Vecchio makes this a unique Suite, finely furnished with a four-poster bed and walls lined with elegant fabrics. This room is designed for those wanting time for themselves. Its wellness area with a chromotherapy system, double jacuzzi, turkish bath for two people and two sun loungers offers maximum relaxation. 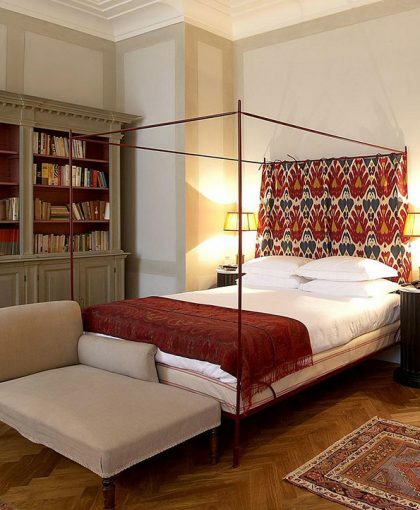 Our Library Rooms are furnished with wall-to-wall libraries with period volumes and literature on Florence. 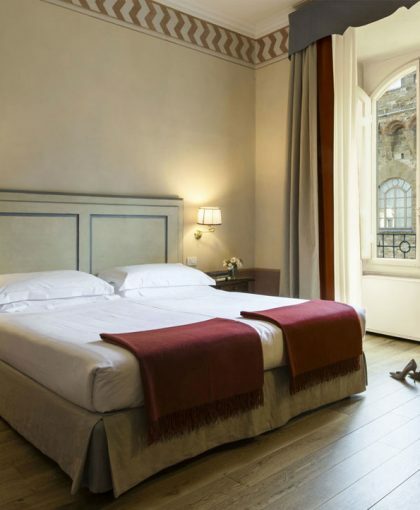 They offer views of via de' Tornabuoni or the Arno. 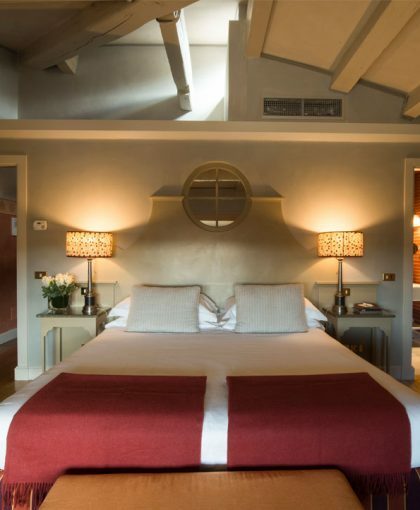 The exclusive jasmine-perfumed private terraces and sweeping views of Monte Morello and the Appenines characterize these splendid rooms in the Medieval Tower. For further information do not hesitate to contact us using the form below, you’ll have the answer as soon as possible. 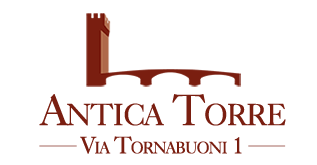 By checking the box above I authorize the use of my personal data supplied in compliance with the Privacy Law 196 of 2003.